Can Rainbow Rowell do no wrong? I think the answer to that question is yes. I read Eleanor & Park earlier this year and absolutely loved it. So when I heard Rowell had another YA coming out, I had to have it. And with so many rave reviews, I knew it had to be good. Someone even told me people were saying it was better than Eleanor & Park. I was skeptical at that--could Rowell top that? Then I read the book and MY GOSH, I think she could. And did. Now, for Fangirl. I'll start off with what I didn't like...which is basically nothing. For the longest time, I kept thinking to myself, "there is nothing wrong with this book." Of course, nothing is perfect, and I did end up finding a few things I didn't love--some open-endness (sorta) and the ending, because it wasn't satisfying enough. (Oh my gosh, are flips-the-pages-over-and-over-is-that-really-the-end endings Rowell's trademark? She's going to destroy me. (In a good way.)) And really, that's mainly because I wanted MORE. When I first looked at my copy of Fangirl, I noticed two things: kind of thick and small font. (Plus the cover, of course, and it was cool how well it matched the book, i.e., I'm pretty sure the characters wear what they're wearing on the cover.) And I thought, "WHY?" Because that's kind of intimidating and I've been in a book slump and all that, you know. But then I read it and that didn't matter, because there weren't enough words. I needed MORE. Also, at one point, a thought randomly occurred to me: I kind of want to DNF (did not finish) this book. Why would I think such a thing about this book? It's complicatedly simple: I didn't want it to end, and by not finishing it, the book would never be over. Rainbow Rowell could write a book about two garbage cans falling in love and I would read it. At the end of a rainbow, is there a never-ending pot full of Rainbow Rowell books for me to read? I made a face similar to this a lot, but times a hundred. And maybe with some feet kicking. In the end (I wish there wasn't an end. 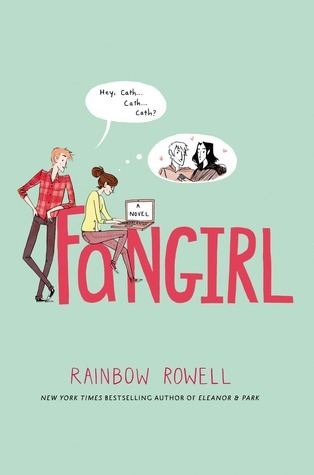 In fact, Rowell should write sequels to Fangirl), I can't give enough praise for this book. I felt great reading it. I loved it. I kind of want to (kindly) say you'd be a fool not to read it. It may be my favorite book of the year. I want to reread it already. I want you to read it. It's a feel-good book, and it's a gives-you-feels book. I am simply fangirling over Fangirl. Rainbow Rowell has done it again, and don't be surprised when she does it again. And again. And again. Did I love it? OHMYGOSH YES. Would I reread it? Absolutely! Would I purchase it? I want it NOW. Who would I recommend it to? EVERYONE. Even your dog. I think I agree with absolutely everything you said! This book was so wonderful. :) And no worries about skipping the Simon parts; I wanted to SO badly, since I guess I didn't really care? I cared about Cath and Levi and didn't want anything standing between us! I LOVE your comment about DNF-ing it just so it didn't end! :) Perfect idea. Great great review!! So glad you enjoyed this book!! I haven't read Eleanor and Park yet but I've heard so many great things about it that I just HAVE TO. I preferred E&P I think in part because I didn't like the Snow fiction/fanfiction very much. Can't wait for more Rowell next year! In the first few chapters, I was very skeptical. I thought Cath would end up with a too-perfect boyfriend who swept her off her feet and I was NOT dealing with that plot again. 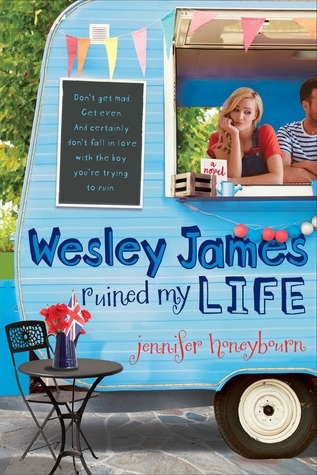 But the novel actually goes in a more unexpected direction and it ends up being sweet and far more realistic. It's light (with some serious parts), fun to read, and super relatable for writers, readers, and fangirls in general.